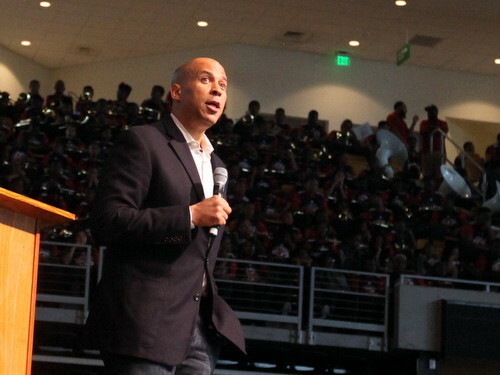 Widely viewed as a top contender for the Democratic Presidential nomination, U.S. Sen. Cory Booker told thousands of New Orleans high school students on Friday morning that they have the power to bring about the next generation of social changes in America. Booker has yet to declare publicly whether he will run for President in 2020, but has been attending numerous events in the early-primary states of Iowa and New Hampshire, and said last month that a decision was coming soon. Booker did not respond directly to Richmond’s challenge, but instead spent his address to students relating the story of his father’s purchase of a house in New Jersey. Every time his father visited a house, Booker said, he was turned away by real-estate agents who said the property had already been purchased. Realizing that he was being lied to because he was a black man, Booker’s father enlisted the help of a fair-housing group who recruited a white couple to go through the motions of buying the same house. On the day of the closing, Booker’s father and his attorney showed up to buy the house instead of the white couple, but before they could speak, the seller’s agent punched the family’s attorney in the face, Booker said. His parents won the case, however, and were ultimately able to buy the house where he would go on to grow up. “We can’t allow our inability to do everything to undermine our determination to do something,” Booker said. Years later, Booker met the same housing attorney, a white man, and asked him why as he decided to help black people buy houses in the 1960s. It turned out that the same attorney had been inspired by seeing the courage of the marchers in Selma who were tear-gassed by Alabama State Police — and that chain reaction of inspiration is the lesson that young people should follow. “Think about that power,” Booker said. “Here are a bunch of a defiant marchers on a bridge in the 1960s, who — just by standing up for what was right — they released an energy into the universe that instantaneously leaps 1,000 miles and changes the heart of one man in a couch in New Jersey, who then goes on and gets to work, who changes the outcome for one man standing before you, and changes the outcome for generations not yet born. While Booker did not ultimately ask the students to vote for him for President, he did have one request as he finished his address to them: a “selfie” photo for his social-media feed. 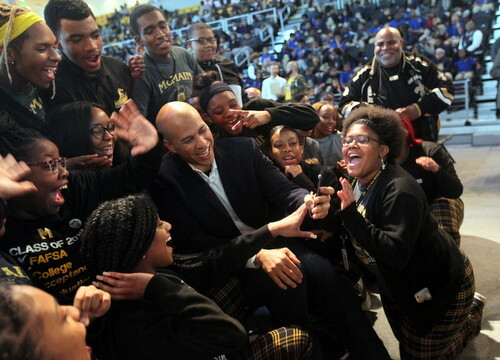 As the Senator pointed his cell phone out at the crowd, cheers rose from the New Orleans students that Booker said would be heard all the way back to New Jersey. See our Facebook page for video of the entire rally, or the embedded excerpt above for just Booker’s remarks.